Two lucky first year students in the Multimedia Design Department were the recipients of Apple Mac Laptops recently. 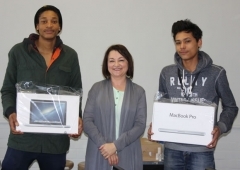 Omar Kassiem and Lesego Mashabela each received an Apple MacBook Pro and Graphics software from Marietjie van Rensburg (Learning and Development Manager) from Mediamark. Mediamark is a specialist media solutions company comprising Mediamark Radio, Mediamark Digital, Mediamark Events and Mediamark TV. This initiative is part of the company’s Social Involvement project, and aims to make the study lives of deserving students a little easier.